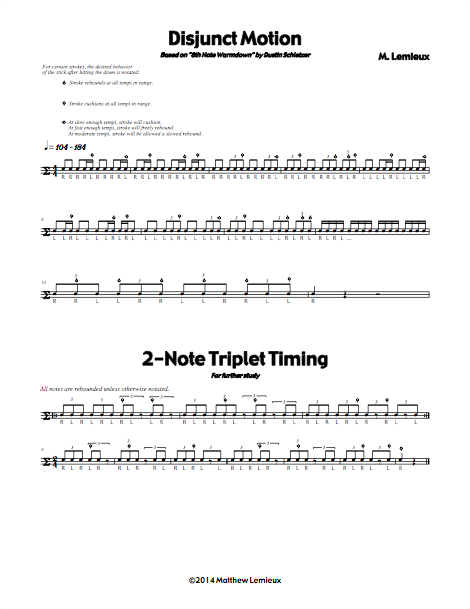 This page consists of exercises that are especially focused on simple, fundamental motions: e.g., upstrokes, prep strokes, and downstrokes. ∆Effort consists of a doublebeat/triplebeat pattern that can be treated as a multistroke, stick control, or timing exercise. Different variations check your timing, hand-to-hand consistency of motion, and sound quality. Unified Fields combines hand-to-hand independence patterns with unison doublestop patterns in a manner that pointedly tests your accent-tap and legato fundamentals. Disjunct Motion was written in contrast to Weber State's Conjunct Motion exercise, which used doublestops to work on legato fundamentals. In this exercise, the rebound/cushion dichotomy is explored with the non-lead hand in different contexts that will depend on tempo for clear definition. The point is that sometimes it is best to rebound, sometimes it is best to cushion, and in some cases it is best to allow the stroke a slower rebound to fill the time up between strokes. Upstroke March is an étude for working on comfort and consistency with the quick upstrokes you will encounter in various flam and singlestroke patterns. Often, with quick upstrokes, you either lighten up the taps before the upstroke, and they sound weak, or you smack the crap out of the accent after it, and it sounds more harsh than other accents in the phrase. By putting even more taps and accents around the upstroke, you have something for your ears to compare it to, which should help you to develop better habits with quick upstrokes.